A lightning fast Broadband internet connection is still a distant dream for many internet users living in rural areas or developing countries. It's frustrating wasting time while you wait for Web pages to appear. 1. Turn off Graphics and rich multimedia content in IE (see graphic). 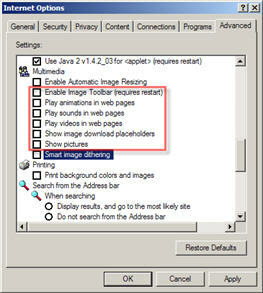 Graphics and embedded videos or music files take time to download and you can disable them to speed up browsing. 2. Don't use fancy email signatures with graphics - Email stationery will increase the size of your email message and slow down the time needed to send each message. 3. Increase the size of your web browser cache. When you revisit a webpage, most of the associated web graphics will already be downloaded on your computer, decreasing the amount of time it takes to open a page.